These Javanese young ladies were so friendly and even posed for pictures as I bought my coffee. There was one thing I knew I wanted to bring home from my trip to Java: coffee. Not just any coffee. The most expensive coffee in the world. Kopi Luwak. 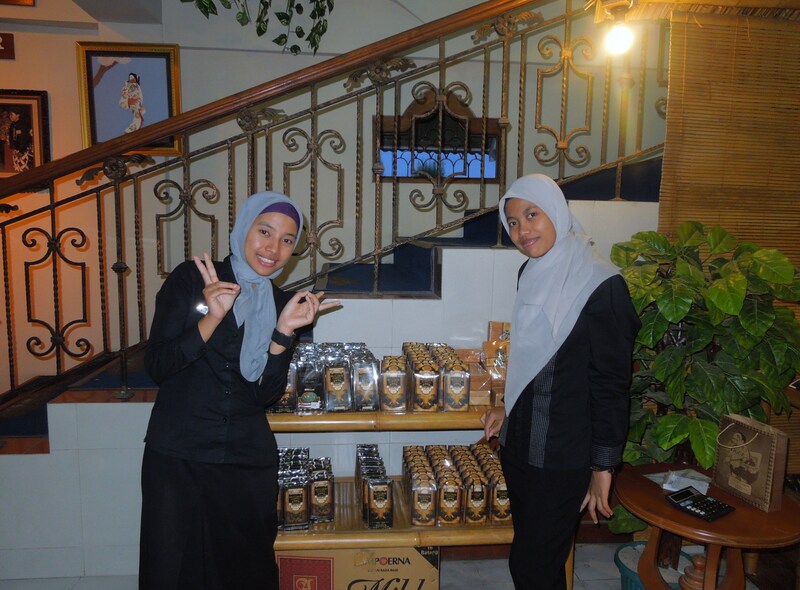 You may be asking yourself, what’s so special about Kopi Luwak? Well, it’s harvested from the poop of a civet. 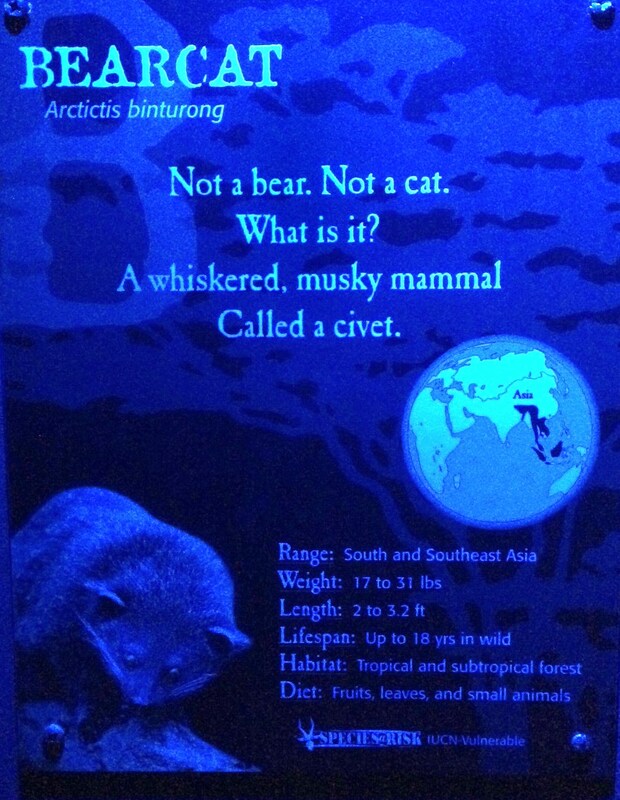 What is a civet? The term ‘civet’ describes a dozen different mammal species mostly found in southeast Asia. They generally look like cats with the heads of a mongoose. Not that I’ve ever seen one outside of the Cincinnati Zoo. Hhhm. My husband and I are Bearcats. Maybe we could…. no. The civets in Indonesia eat coffee berries which then travel through their digestive tracts without being digested. During this process, the coffee berries are enhanced with enzymes before they’re pooped out, harvested, and roasted to create the world’s most expensive coffee. Which leads one to wonder why someone ever did this in the first place, and why I can’t get my cats to do the same thing at home. I could be a millionaire! Instead, I found bags of Kopi Luwak in a tourist centre. (Of course.) None of the locals I asked had ever tried it, but they all knew of it and laughed when I said I wanted to buy some. I’m not surprised they hadn’t imbibed. It is way out of their average price range — and they probably have more sense than I do. So I bought a bag of coffee for $18.00. It made about one pot. My husband and I were hesitant to drink it because it seemed like we needed a REALLY special occasion (not because we worried about drinking coffee that civets had pooped out). But we never could decide what kind of occasion would call for poopy coffee. Instead, on a typical Saturday like any other, our Kopi Luwak Day finally came. Looked like any other coffee beans. We examined the coffee like true connoisseurs. The beans looked like regular coffee beans. We brewed a pot. It smelled like regular coffee. It looked like regular coffee. We took a sip. It tasted….smooth. Mild. Like regular coffee without any of the bitterness. If you usually add cream and sugar to hide that bitterness, you wouldn’t need to with Kopi Luwak. It was very, very smooth. Which made me realize — it was kinda wasted on us. We are such coffee-aholics that we’ll drink coffee thick as tar from a gas station. We’ll drink coffee any way we can get it. Dare I say we might even drink coffee harvested from our own cats’ litterbox? 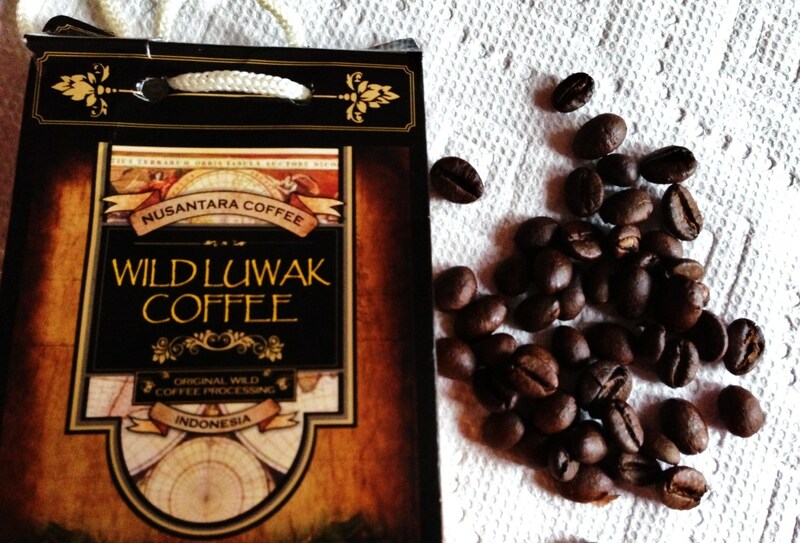 How does a nice cup of Kopi Luwak sound to you? Yeah. It’s hard enough to stand changing the litterbox, let alone thinking of ingesting anything that comes from it. Hahaha. 🙂 You’ve got to be “kid-ding!” ;p I’m afraid to know what delicacy comes from goat poop, but if I were in Morocco, you know I’d try it. Hahahaha you are one brave lady!!! We were happy to try it once, but probably wouldn’t go out of our way (or pay the exorbitant price) to try it again. Good question, though I could ask the same of my dog and all the paper towels he eats. Maybe the berries just tasted good?? I’d heard of it, but wasn’t sure how I felt about drinking it. I must admit, I was very relieved to see that the coffee beans looked like any other coffee beans. That eased my mind. As as a coffee connoisseur, I’ve always wanted to try this, despite how gross it sounds! I do wonder what non-coffee lovers would think of this. It does taste like coffee, but doesn’t have any of the bitterness. When you said litter box I thought you were going to talk about, well, anything but a litter box. Just couldn’t see where the litter box was going to fit in. Thought, this must be some clever misdirection or cultural term unrelated to cat’s litter. Well, now I see it. I think I’d have to try it from your description. I can’t stand to drink coffee unless it’s mild and smooth (I often get around this with a lot of milk, but my other trick is to drink tea instead). You may really like this, then. My husband even said that it was smooth like tea. Alright. I’ll look out for opportunities. I’ve heard of this kind of coffee before, but don’t know if I’d have the courage to try it. Glad you did, because your post made me laough out loud! Thanks, Naomi! Glad you could experience it vicariously through me. Sometimes, and especially in this particular case, that seems the best way to go! I don’t really know how to differ one coffee from the others. Coffee is coffee to me. The way I see it. In a cafe, they skim the milk better. They crunch the coffee beans more finer. That’s all it really is. And sometimes in the end, it’s how well you measure the amount of coffee, sugar and/or cream. Love how the Japanese pose to pictures, and they are so willing too.